With black beans, smoked paprika and coriander and ground cumin, these vegan sweet potato quesadillas are hearty and packed full of flavour. Serve with a generous dollop of lime cashew cream and an extra squeeze of lime along with a side salad for a delicious weeknight dinner. I’ve been on a bit of a spice kick of late. Smoked paprika in particular. I’ve been adding it to everything lately, but it works especially well with another favourite of mine, sweet potato. It adds a lovely smokey sweet flavour to this vegan sweet potato quesadilla. First things first, if you are looking for ooey-gooey traditional cheesy quesadillas these won’t hit the spot! Sorry! 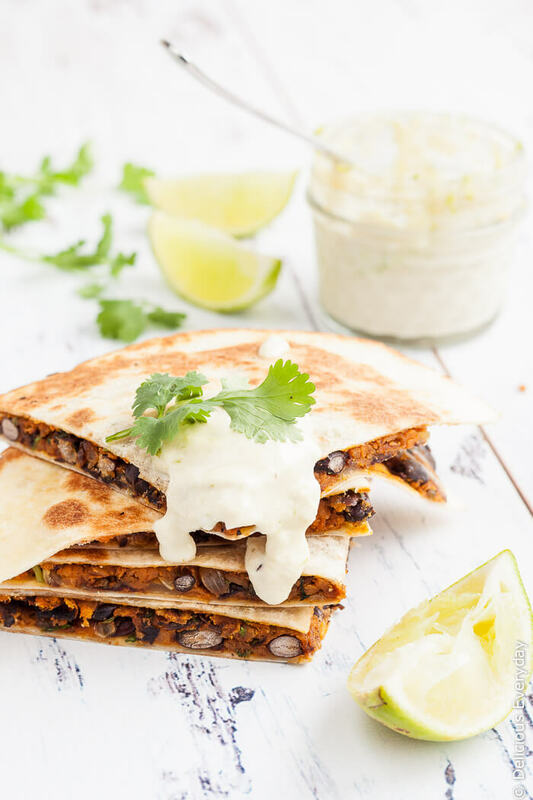 Despite the lack of cheese though my sweet potato quesadilla is packed full spices, hearty black beans and along with a squeeze of lime it is so packed full of flavour that you won’t miss the cheese one bit. 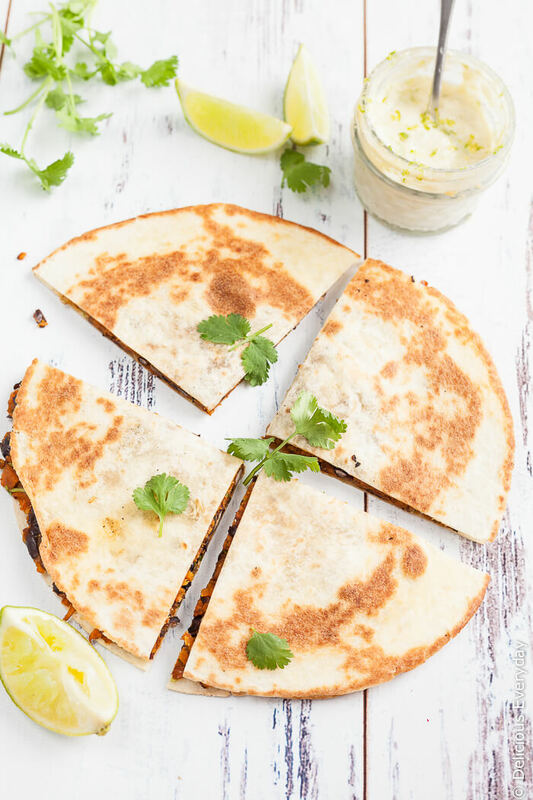 And, even better, these quesadillas are the perfect way to use up any left-over baked or mashed sweet potato that you might have! One word of caution, stay away from any tortilla’s labelled as soft or flexible. You don’t want those! They’ll just flop about and spill their delicious filling when you try to flip them in the pan. Believe me. I made that mistake! While the pan fried sweet potato filling is still delicious, it’s even better when it remains inside its crisp golden tortilla casing. Go for corn tortillas if you can get your hands on them. Not only do I think they taste better, they seem to get a little crispier when fried, and I’m all about the contrast of the crispy tortilla against the soft filling. 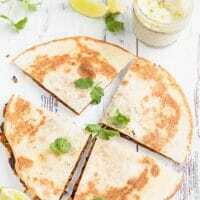 Serve this vegan quesadilla with a salad for a great quick and easy weeknight meal, although personally I like them as a great slow weekend lunch. Place a frying pan over a medium low heat and add 2 tsp olive oil. Add the onion and cook until golden. Add the black beans to a bowl and lightly mash. Don't mash them to a pulp (otherwise your filling will take an unappealing orangey grey colour), just enough so some of the beans are broken. Add the onions to the bowl along with the spices, harissa and coriander. Grate the sweet potato. A food processor is a great speedy way to do this quickly. Leftover baked sweet potato or mashed sweet potato is a great shortcut too. If you are using raw sweet potato add a further 2 tsp of olive oil to the pan and cook over a medium heat. Don't stir too frequently. You want the sweet potato to lightly caramelise a bit (adding flavour). Once cooked add to the black beans and onions. Stir until well combined. Top 2 tortillas with half the filling each. Spread the filling to the edges and top with another tortilla, pressing down lightly so that the mixture helps the tortillas stick together. Return the frying pan to a medium low heat, add a little olive oil and add one of the quesadillas. Cook until lightly golden before carefully flipping and cooking on the other side. Repeat with the second quesadilla. Cut the quesadillas into quarters or however you like and serve with a wedge of lime, lime cashew cream and a light salad. I LOVE a lightened up quesadilla! Bookmarked, this looks so good!